A mid-week dump of the Fab Four blog posts of the last 7 days. 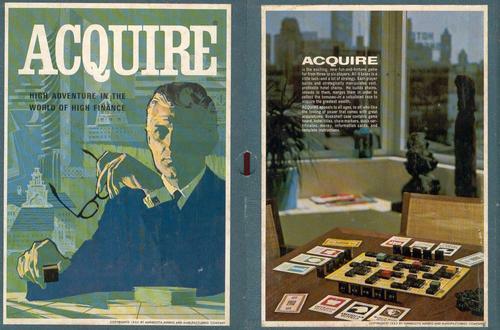 Huber’s must-read is an in-depth look at the development of Sid Sackson’s masterpiece, Acquire. In olden days (around 30 B.E.—Before Euros), publishers would take a designed game in its raw state, then bring it in-house for development. In the Kickstarter Era, game development is centered wholly on the Designer, who does his job and then posts on KS. A game publisher swoops in to buy it whole, and publish it without a lot of further work. The middleman (developer) seems to have been cut out. Yet the developer still has a place in the industry, especially when you look at German publisher Hans im Glück. Huber sings the praises of its founder Bernd Brunhofer , who aggressively playtests the games he buys and is open to changes, as long as they stick to the game’s core. 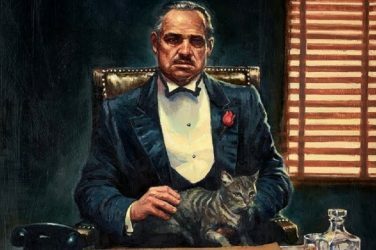 So – is there a way for the level of development that occurred with Acquire to happen in the age of Kickstarter™? Some publishers certainly do develop their games at that level. … Dominion, published by Rio Grande Games, being a good example. But could this be extended to more games? It certainly would add to the expense of publishing a game, which in an industry with margins as thin as often seen with board games, is a real issue. Though if the results are similar to those seen with Acquire, the costs could certainly be justified. Check out his whole post and see how a Classic was born! Hillsman argues persuasively that writers (i.e., we bloggers) need also to be readers, and then commenters. And he creates a challenge far more fruitful than the ‘10×10’ stuff that continues to circulate. For the rest of June, I challenge each of you to post one comment on someone else’s media for each piece of your own content you put out there. If we start talking to each other, if we open this dialog, we will … generate, I’m sure, new ideas for future blog posts, videos and podcasts–after all, my idea for this challenge came from a community discussion during Board Game Hour! I’m going to accept that challenge by commenting on each of the blogs I quote here! Real-time games are rare in this turn-based world of ours. But they’re worth seeking out and trying. 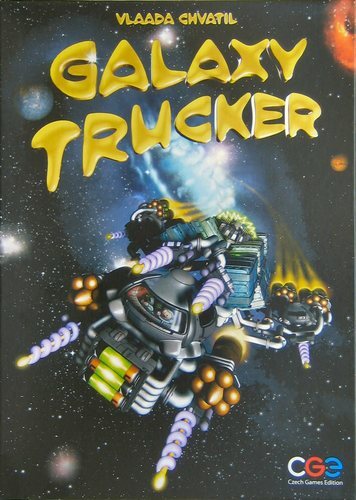 Just listen to Shannon gush about her favorite RTG, Galaxy Trucker. Galaxy Trucker‘s real-time gaming works because it’s full of hard decisions. You constantly want everything: guns and rockets and crew compartments and cargo holds. So you constantly have to prioritize. There are even multiple things that you have to think about, such as the connections between the different ship components: a tile might give you a ship component that you want, but simultaneously restrict your future plays due to its connections. This sort of interplay between a variety of hard choices works very well in a real-time game; it also rewards a skill that I think should be rewarded more in games: the “good enough” decision. He who hesitates is lost, but he who plays with his gut wins. Check out her post and see what other Real-Time games she recommends. Playing games is definitely more interesting when we understand the process of creating them. Filip considers just one aspect of design, the Point of View, and discusses each, 1st, 2nd & 3rd person. It’s easy to see the difference between 1st & 3rd: in a typical RPG, we’re looking down on our characters, experiencing the game through them (3rd person). But in board games where our view is limited only to the cards we hold and the resources behind our screen, we’re scrambling through the game with a 1st person POV. He explains how Hanabi is unique in how it straddles two different points of view. Hanabi is an oddity in that it uses a (somewhat) second person POV. … Yes, Hanabi is first person – you don’t have an avatar in the game – but as you have little control over how the information you’re giving information is used (sic) you’re also playing the other players in second person. You’re not acting on your own, in fact you can’t act on your own, and since you’re experiencing the game through the actions of others it becomes a first person sliding into second person, the way that Story Realms is first person sliding into third person. I think what’s most helpful in reading his post is that I got a better idea of what kinds of games I enjoy most: First Person POV! Camel image by KnowItSome (wikimedia), used under Creative Commons License. 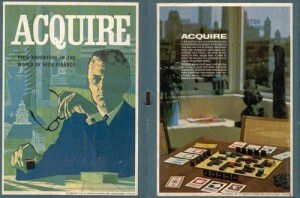 Acquire image by AngusBull (Board Game Geek), used under Creative Commons License. Galaxy Trucker image by Ville Inkiläinen (visard on BGG), used under Creative Commons License.